Caribbean countries must transform their energy systems by creating new, greener sources of power. Puerto Rico lost electricity again on April 18th, seven months after Hurricane Maria first knocked out the island's power grid. For people in some remote rural areas, the blackout was more of the same. Their power had yet to be restored. The dangerous fragility of Puerto Rico's energy systems has put other Caribbeancountries on high alert. Across the region, electric grids are dated, ailing, and overburdened—making it easy work for a powerful passing storm. Caribbean nations also rely heavily on oil and diesel imports to fuel their power plants—a dirty and expensive way to produce energy. So even before the 2017 hurricane season, Caribbean governments were trying to integrate renewable energy sources likewind and solar into their existing grids. Now that task seems far more urgent. To move beyond fossil fuels, Caribbean countries must transform their energy systems by building in new, greener sources of power. That will also make electric grids more resilient to weather extremes because they will be decentralized—pulling from a diverse array of power sources. As an environmental scientist working in Jamaica, I recognize many reasons why the Caribbean region must upgrade its outmoded energy systems. Mitigating global climate change, of course, is a big one. Unfortunately, I believe that climate change will also complicate the region's transition toward renewable energy. The Caribbean is comprised of island nations, which are the world's most vulnerable places when it comes to rising seas, changing weather patterns, and other effects of global warming. The Caribbean is already seeing more weather extremes. Research suggests, for example, that northern Caribbean countries like Cuba, Jamaica, and the Bahamas have gotten rainier over the past three decades, though historical data is limited. Meteorologists also believe that climate change is making hurricanes more frequent and powerful over the Atlantic Ocean. The uptick in severe weather is costly. According to the United Nations, the 2017 hurricane season cost Caribbean countries and the United States $92 billion. As the Eastern U.S. and Caribbean brace for a potentially brutal 2018 hurricane season, policymakers are looking for fast ways to strengthen their power grids. Installing more wind, solar, and hydropower—the world's most reliable and common renewable energy options—would seem to be a more obvious step in the right direction. Between 2015 and 2016, the global capacity of these green power sources rose 9 percent —nearly half of which comes from the widespread adoption of solar panels. After Maria, technology companies like Tesla saw an opportunity to spotlight their products in wind, solar, and geothermal power in the Caribbean. Tesla installed Powerwall solar-powered batteries across Puerto Rico. This technologyhas kept the lights on during blackouts at over 660 locations, though experts cautionthat such solar "microgrids" cannot serve the energy needs of an entire country. But, in a Caribbean of increasing weather extremes, these green energy systems are themselves vulnerable. Modern wind turbines, for example, were first engineered in Europe—a region that rarely experiences Category 5 hurricanes. Wind speeds above 165 mph would tear the turbines apart. Changing precipitation and temperature patterns in the Caribbean also affect hydro and solar power. More rain in the region's north means fewer sunny days than anticipated. Higher temperatures in other countries suggests increased likelihood of drought, leading rivers to run dry. Climate change is a profoundly unpredictable process, though. That makes it harder for weather models to correctly identify which renewable energy infrastructure should be built where. Computer models are inherently imperfect planners. As researchers from the Massachusetts Institute of Technology recently affirmed, plugging in short-term weather data to make long-term atmospheric projections adds "irreducible elements of chaos." Climate change, which affects various parts of the world differently, makes it even harder to accurately predict future weather scenarios. Comprehensive modeling systems that use LIDAR and other remote-sensing technologies do better, but they are too expensive for widespread adoption in the Caribbean. The Caribbean is making progress in planning for a future of more renewable energy, though. Jamaica aims to install new automated weather stations that will collect real-time weather data nationwide. This initiative will help meteorologists across the entire Caribbean better predict future weather, which in turn supports the development of renewable energy systems. So will a new climate model developed by my colleagues at the University of the West Indies. The system, called SMASH, can aid planners in siting wind farms and predicting the path and severity of the hurricanes that could mangle turbines. A new Caribbean drought atlas from Cornell University has compiled climate data going back to 1950. The tool won't just help sustain food production during dry times; I believe it will also provide engineers precipitation data that's critical to planning hydropower enterprises. Cutting-edge hydropower plants that run on urban wastewater may one day also address the current limitations of hydropower in the Caribbean. Many small islands lack the big rushing rivers that allow water to be a meaningful power generator. Wind farms, too, are adapting to the instability of this changing climate. Once firmly pegged to the ground, turbines can now float thousands of feet above the land, spooled out like kites to capture winds where they blow hardest. Floating turbines will also fare better during hurricanes. All of these technologies may eventually help Caribbean countries navigate their way through climate change toward a real renewable energy boom. But the climate change conundrum won't be solved before the 2018 hurricane season hits. This article was originally published on The Conversation. Read the original article. Masaō Ashtine is a lecturer in alternative energy at the University of the West Indies—Mona Campus. Facebook does not sell user data. That is the key. Today in front of the combined Senate committees Mark Zuckerberg made a key distinction. It is assumed that Facebook accumulates data on its users that it then sells to advertisers. But this is not the case at all. Facebook accumulates data on its users that the users allow Facebook to collect. On the other hand advertisers come to Facebook and describe in detail the kind of people they want to reach with their advertisements. Facebook then compares the advertisers' request to the data that Facebook has collected. Facebook then selects the individuals who will see the advertisers who are appropriate and it connects the Facebook users with the advertiser. Actually an algorithm does it. It does not inform the advertiser about any of the actual data used to match it with the Facebook user under any circumstances. Advertiser A wants to advertise snow shoes to individuals who need snow shoes, perhaps, and those who can afford snow shoes. Facebook scours its users for information about the amount of snow they endure. It looks for anything that might be said about snow and snow shoes by its members. Facebook decides which of those who had issues with snow --- probably everybody who has issues with snow --- and Facebook then allows the snow shoe advertiser to access each and every person who has issues with snow who is on Facebook and who -- and this important, who has not specifically said they don't want advertisements for snow shoes or any other shoes. You talk about cars and they connect the car ads to you. You talk about sports cars and the connect the sports car companies (who have paid to be connected) with you. You talk about Chevys and you get some Chevy ads. And for your convenience you get the Chevy ads from Chevy companies that are close to your location, which the local Chevy companies pay for. But the ads are always a pass through from Facebook to you based on your data and not from the Chevy dealer. He may be wasting his money advertising to you. But he will never know it. What is the future of container shipping? Will industry consolidation continue and, if so, who will still exist in 2020? All highly relevant questions constituting a fairly amusing – yet nerdy – game at supply chain conferences. This often comes with the predictable disclaimer: nobody really knows. However, there are three “facts” that make predicting the future of the container shipping industry relatively easy. One wild card remains. Before its expansion, the Panama Canal was sending 4,500 TEU ships into the Caribbean with containers for trans-loading and final destination. Larger 8,500 TEU vessels transiting the Suez brought a little more volume to island hubs. Terminals in Jamaica and the Dominican Republic became trans-load centers for the Caribbean and US port range, while facilities in Colon could swing cargo to a wide range of destinations including South America. The port of Kingston, Jamaica is getting a facelift with the infusion of $600 million for upgrades and expansion to Kingston Container Terminal (KCT). Terminal Link, a subsidiary of CMA CGM and the Jamaican Government, entered into a partnership called Kingston Freeport Terminal Ltd. (KFTL). KFTL will operate the port jointly for 30 years before turning the facility back to Jamaica. Terminal Link will invest $460 million on reinforcing 394 feet of the wharf to meet Euro Code standards and dredging alongside 2,625 feet of the quay to 51 feet. The remaining funds will be spent on terminal expansion and upgrades. In addition the government will seek private partnerships to spend $130 million to dredge Kingston’s harbor to accommodate Neo-Panamax vessels arriving from the canal. The government believes partnering with Terminal Link will bring a major dynamic to the table through CMA CGM’s world-class service with strong ties to Caribbean and Latin Markets. Prior to the canal’s expansion, the Port of Rio Haina in the Dominican Republic was capable of handling trans-load traffic for the region. With just under 1,731 linear feet of usable wharf face, the Puerto Hiana Oriental facility could accommodate one Panamax vessel working it with two shore-mounted cranes. Thirty minutes east of Santo Domingo lay the suburbs of Boca Chica and Andres. On the adjoining coast sits the Port of Caucedo. Operated by DP World this facility is fully capable of handling the largest ships the Panama Canal can throw at it. Opened in 2002 the port had from its inception counted on the growth in traffic an expanded canal would bring to the Dominican Republic. A 3,280-foot quay comprising three berths with 49.2 feet of water alongside each is sheltered from the open sea by 2,952 feet of breakwater. DP World holds a 50-year concession on the facility and intends to expand its capacity from 700,000 TEUs to over one million containers. The consortium of NYK, Evergreen and Hyundai operating joint services in the Caribbean have spent $15 million to create a Caucedo Logistics Center to improve their competitiveness in the region. The Center will coordinate the discharge and trans-loading of containers destined to various ports served by the three partners. While port expansion in Balboa has taken center stage in recent years, the three terminals comprising the Atlantic port of Colon should not be overlooked. Hutchinson Port Holdings (HPH) Cristobal: HPH operates two terminals in Panama, one on each coast. Placing emphasis on the cruise industry, Hutchinson added a state of the art berth number 6 to Cristobal Port, which can handle two of the largest ships, which enter or exit the canal. The container terminal has 11 berths with a total of 14,468 feet of wharf. Thirteen Panamax and Post Panamax cranes handle vessels drawing up to 42 feet of water. The facility’s annual capacity is 2 million TEUs. Manzanillo International Terminal (MIT): Built on the old Coco Solo Sur Naval Base, MIT is operated jointly by Carrix Inc. (SSA Marine) and the Motta and Heilbron families. A multimodal facility, the container terminal is equipped with 19 Post and Neo Panamax cranes on 5,380 linear feet of quay. The current depth alongside is 42 feet but can be dredged to 49 feet in the future. MIT has an onsite logistics park adjacent to the FTZ (Free Trade Zone) and easy access to the Panama Canal Railway. The terminal handles around 3.5 million TEUs per year. Operated by Evergreen Marine, CCT can handle 2.4 million containers per annum. The depth at the newly completed Berth 4 is 54 feet. Three Neo Panamax cranes discharge vessels loaded with 23 containers across their beam. Plans to deepen Berth 3 and extend both 3 and 4 will bring the total useable wharf up to 2,559 feet allowing the facility to handle two 13,000 TEU ships at the same time. CCT has easy access to the FTZ and near dock connection to the railway. As the Caribbean gears up for Very Large Container Ships (VLCS), ports will have to become more competitive. The winners will be those terminals, which can turn boxes quickly and efficiently. It will require a combination of deep draft, available cranes and skilled labor. Wider beam VLCSs will need cranes with greater out-reach. Crane operators will also have to be conscious of lift and discharge time. Today’s facilities are only achieving 28 to 32 lifts per hour. To turn transition cargo quickly the terminal will need to either increase lifts per hour or add additional cranes to each vessel worked. The container boom is just beginning in the Caribbean Basin. Will that momentum reach the trans-load ports of Latin America? My friend Peter Tirschwell thinks this is important for you to know,,. On July 1, 2016, a new SOLAS (Safety of Life at Sea convention of the International Maritime Organization or IMO) takes effect requiring shippers whose name appears on the bill of lading to verify the gross mass of a container carrying cargo when tendering the container to the ocean carriers and terminals. Many questions still remain unanswered, and there is widespread frustration about lack of information including from key service provides including container lines and marine terminals. Rules and legal enforcement are likely to vary potentially widely among countries, ocean carriers and marine terminals, making this rule potentially a big headache for shippers to comply with. But a few things are already clear: On July 1 the rule becomes not just international law under the IMO but national law within the 162 countries that are signatories to the SOLAS convention. The legally responsible party for providing a verified gross mass (VGM) signed either electronically or on paper is the shipper. Approximately 300,000 container weights will need to be certified each day globally, and roughly half of all booking requests and shipping instruction submissions each day are non-digital, in other words, in paper form, according to Inttra. Early analysis suggests the ocean carrier and the marine terminal will be strict in not accepting containers lacking an accompanying VGM since under the SOLAS rule they can be held responsible, and thus incur unacceptably high legal liability, for loading a container for which a VGM hasn’t been provided. For example, Hapag-Lloyd said, "A packed container, for which a verified gross mass has not been obtained, will not be loaded on the vessel." Crowley said it "stands firmly behind the rationale for this regulation." Marine terminals may in some cases offer weighing services if it can be done without disrupting regular terminal operations, but this will not be in all cases, as some terminals, such as Maher Terminals at New York-New Jersey, in December said it does not have the capacity to offer weighing services for non-compliant containers and won't in-gate any container without the VGM already received via EDI. Overall, frustration levels across the industry were rising as of January, 2016 based on lack of specific plans by key parties and concerns that individual countries will issue differing regulations, creating a potential compliance nightmare that could impact the flow of trade. Part of the issue stems from the desire by all parties to avoid incremental costs which has resulted in limited progress in the key private-sector issues that the SOLAS rule leaves up to the commercial parties to work out amongst themselves. Bjorn Jensen, vice president for global logistics at the consumer goods manufacturer Electrolux, reflected these sentiments on Jan. 7, saying "I am immensely frustrated, as is every other shipper I have talked to, by the near total lack of industry co-ordination, and indeed by the feeling I'm getting that even carriers have no idea how this is going to play out." The following questions and answers are drawn from a variety of sources, including JOC.com reporting, published commentaries, press releases, statements by speakers at JOC events, presentations, government and company documents, and an official Q&A published jointly in December, 2015 by the World Shipping Council, TT Club, Global Shippers Forum and International Cargo Handling Coordination Association (ICHCA). Additional information can be found on the World Shipping Council website here. Links are provided throughout. A page containing the full JOC coverage of the issue is here. This FAQ has been updated as of Feb. 5, 2016 and we will continue to update it as more information becomes available. - A source at the International Maritime Organization said there are currently no efforts under way to delay implementation of the SOLAS container weight rule, See 2) below. - Another Method 2 issue is that packing cartons are printed well in advance of packing, and the weight printed on the carton may be different to the mass of the contents, see 17) below (Jan. 20). - Complying with the new SOLAS VGM rule is mandatory, so carriers will not have a choice of whether or not to accept containers without a VGM, see 2) and 12) below (updated Jan. 20). 1) At a basic level, what is the new requirement put on shippers? Under the new SOLAS VGM (verified gross mass) requirement, the shipper named on the ocean bill of lading is the party responsible for providing the container carrier and the terminal operator with the verified gross mass of a packed container. The carrier and the terminal operator must not load a packed container aboard a ship unless they have the verified gross mass for that container. The “shipper” according to MSC 1 / Circ. 1475 (the IMO’s guidance on VGM), is “a legal entity or person named on the bill of lading or sea waybill or equivalent multimodal transport document as shipper, and/or who (or in whose name or on whose behalf) a contract of carriage has been concluded with a shipping company.” This responsibility shipper doesn’t go away if a shipper uses a forwarder to pack and weigh a container, forward it to the port and even make the booking with the carrier. If the forwarder is acting purely on the instructions of the shipper to undertake that work on his behalf, and the shipper’s name is still what appears on the bill of lading, it’s the shipper that is responsible for verifying the gross mass weight. The shipper will have to ensure that it’s satisfied with the integrity of the forwarders’ weighing process if it’s relying on the forwarder’s measurement. 2) How will the rule be enforced, and what are the risks for shippers? Certain basic facts are known. The rule will be officially enforced by the maritime authorities of individual nations, whose implementing regulations will vary, potentially widely depending on country and region. As a practical matter the real-world “enforcement” that will affect shippers most directly seems most likely to be carried out directly by the container lines and terminal operators, who are both required not to load a container without the certified VGM document accompanying it and to use the VGM for stowage planning. Enforcement agencies may implement measures to satisfy themselves that compliance is achieved, which could include documentation checks, auditing or random weight checks. The carriers and terminals are expected to be disciplined in their unwillingness to accept containers tendered to them without the required VGM documentation in order to avoid costs and penalties such as delayed sailings, to avoid costs for the storage and handling of affected containers which could congest terminals and which might be difficult to recover from the shipper, and especially to avoid liability in the event of a casualty whether at the dock or at sea. Hapag-Lloyd in a brochure on the issue said "A packed container, for which a verified gross mass has not been obtained, will not be loaded on the vessel." Thus, “the risk is your container won’t get shipped. It would be turned away from the terminal,” said Global Shippers Forum secretary general Chris Welch told JOC.com in an interview in October. Some, though not all, terminal operators are considering introducing weighing services as a revenue stream and to assist non-compliant containers to be loaded, as this paper from the Port Equipment Management Association suggests. Some terminals like Maher at New York-New Jersey are saying they will explictly not offer weighing services on their facilities and will turn away non-compliant containers at the gate. But not all terminals are expected to adapt such a stringent "no VGM, no in-gate" position since carriers would likely see this as disrupting the flow of their customers' cargo. As a bottom line matter no container lacking a VGM will be included on the "terminal load list" which is the list of all containers to be loaded provided to the terminal by the ocean carrier prior to the commencement of vessel loading. At the same time, some are speculating that since many shippers are telling carriers that they won't be ready for implementation of the rule on July 1 (see report on Inttra shipper survey released on Dec. 1) there may need to be some kind of an initial soft launch, similar to how U.S. container security measures were implemented, following by a hard launch when penalties would take effect. Or if confusion continues to grow some may seek a delay in implementatoin. But that is mere speculation at this point. In fact, an IMO source said in late January, 2016 that no efforts were currently under way to delay the ruling. Some goverments like the UK have begun to issue guidelines for example for certifying those who will be carrying out Method 2 weighing procedures (that is, weighing the contents of the container and adding that to the tare weight, or unloaded weight, of the container). 3) When does the new regulation take effect? The new regulation, called Verified Gross Mass, becomes legally binding on July 1, 2016, and will apply to all containers loaded for export on or after that date, from any port in the world. Containers loaded prior to July 1 that are already in transit once the new rule is imposed will not be affected. Container Weight Infographic. Click to Enlarge. 4) Will legislation be required by each country to make the convention law at their ports? No. The rule is law in each of the 162 countries that are signatories to SOLAS. The reason is that SOLAS has international legal status so there need not be any further implementing legislation for states that are party to it. There has been no precedent for non-implementation or delay in the implementation of a SOLAS regulation, so there is no reason to expect any delay in implementation beyond July 1, 2016, although due to the many complexities that are arising and described at various points within this Q&A, some are beginning to say that a delay or phased in approach may be neede. As an United Nations agency, the IMO leaves it to each of the individual countries to implement the ruling, which means that the exact system of penalties and procedures is left to each government and managed by the agency representing IMO in the respective country, for example the Coast Guard in the U.S., or the Maritime & Coastguard Agency in the U.K. The exact timing of regulations being promulgated and enforced will inevitably vary country by country. That said, it is understood that several countries’ agencies are currently investigating how to prevent the loading of container without the VGM submitted. However the potential for lack of uniformity in the implementing regulations among countries has created alarm. 5) What is meant by the requirement for a “signature” on the VGM document? What the SOLAS rule requires is that the shipper communicates the verified gross mass in a “shipping document.” It must be signed by a person duly authorized by the shipper, with a first and last name, not just a company name. The signature may be an electronic signature or may be replaced by the name in capitals of the person authorized to sign it. The VGM and signature can be part of the shipping instructions communicated via electronic data interchange (EDI), or be contained within a separate communication including a hard copy document. In either case, the document should clearly highlight that the gross mass provided is the “verified gross mass.” There is no requirement that a so-called “weight ticket” generated by a weighbridge be presented, but national implementing regulations may require that shippers using Method 1 (weighing of the cargo and container as one) produce weight tickets or other documentation upon request. One NVOCC that handles less-than-containerload cargo has created a document that it is providing its customers to be filled out, but given that it's the shipper on the carrier bill of lading says it will also be weighing cargo that it consolidates along with other customers' cargo, discussed here. 6) How will the signature and documentation be handed off from one party to the next in the supply chain? This is an area where regulations won’t apply and it will be a matter of coordination among parties, with processes very much still to be worked out as of early 2016. The pressure is on given the large percentage of containers that are shipped using non-electronic documents including hard copies and faxes. According to a Q&A published in December by the World Shipping Council, the Global Shippers Forum, TT Club and ICHCA International, “There are inevitable process challenges to ensure effective coordination between the shipper and hauler to achieve effective documentary handoff (whether electronic or paper) to avoid in-gate delays. Such processes should be discussed between the commercial parties, including the maritime carrier and the terminal operator.” In reality, electronic communication will need to be core to how the signature is passed from party to party, though use of electronic data interchange or other electronic platforms is far from universal within the industry. Maher Terminals at the Port of New Jersey said it will it not accept containers without an electronic signature sent via EDI. The ocean carrier portal Inttra which facilitates electronic documenation has been active in the issue, indicating the importance of EDI and other electronic systems in implementing the rule. As of early 2016 there was an effort under way to create a new, standardized electronic shipping document solely for the purpose of conveying the VGM along the supply chain. According to this FAQ published by Hamburg Sud, it will accept a VGM whether in the shipping instructions, booking request, or separately for example in a declaration containing a weight certificate issued by the weighing party, but irrespective of how it is conveyed it must state that it is the VGM and be signed by the representative of the shipper. 7) When sourcing from contract manufacturers at origin countries, will retailers, consumer product firms and others rely on their manufacturers to conduct the weighing at the origin? Most shippers use third-party logistics companies (3PLs) to pack and transport containers to ports. Therefore, it is fair to expect that contracts for contract logistics and freight forwarding services will be amended to reflect the VGM requirement. Shippers can expect 3PLs to try to assess an incremental fee to weigh containers. It is unrealistic to expect the shipper themselves to perform this work themselves in most cases since they lack resources, space and staff able to undertake the actual weighing of cargo or loaded containers. Therefore all 3PLs and freight forwarders will have to offer such services in some form, but in order to minimize supply chain disruption as the implementation date approaches in 2016, a customer should inquire early to be certain that the requirement can be met. In situations where the manufacturer loads the container, the shipper - who is the responsible party under the rule - will have to leverage vendor-compliance tools and processes to ensure that the weight the manufacturer states for the bill of lading is the real weight that will hold up in an inspection. But this opens the door to risk; according to one shipper interviewed by JOC.com in January, "what goes on the paper might not be what is in the box, and that will leave us with a serious problem. We will have to enforce the rule at all our vendors." According to some sources, China factories will be reluctant to invest in weighing equipment and overall are shrugging off the impending rule. 8) Are shippers that only tender partial loads to a forwarder or master loader responsible for providing a VGM? No. The responsibility for providing the accurate, verified gross mass of a co-loaded container remains with the shipper named on the maritime carrier’s bill of lading, i.e. the “master” loader or freight forwarder or NVOCC. The contractual terms between the ultimate shipper and a co-loader may allow the shipper to provide a VGM to the master loader, or the master loader or forwarder might undertake the weighing process themselves, but either way this would be a commercial arrangement between those parties. However, the situation could be different in the case of full container loads that move under NVOs' contracts with the carriers. One larger trans-Pacific NVO told us in mid-December that he expected the NVO to require the shipper to provide the weight of the cargo even if, according to the rule, it is the NVO as the official shipper on the bill of lading who will be required for presenting the VGM to the carrier. However as of mid-December NVOs had not disclosed their official policies. Still, for shippers shipping full container load boxes under an NVOCC bill of lading, they will most likely have to provide a weight to the NVO which would include the figure on its own bill of lading. For shippers using NVOs that consolidate boxes on their behalf - a business dominated by carrier-owned or former carrier-owned NVOs like APL Logistics, Yusen Logistics and Damco, those NVOs will need to undertake the weighing directly themselves in order to be in compliance. This article describes how one NVOCC that consolidates less-than-containerload cargoes is ensuring that the VGM rule gets properly implemented without impacting customers' supply chains or its own operations. 9) Is it most feasible for the weighing process to take place at the port or earlier in the supply chain? There is a lot of debate and discussion around this issue currently, but the more we look into this the more it looks like ports will for the most part not be equipped to perform weighing services. According to Inttra, it is unrealistic to expect weighting units to be installed at ports in even close to a necessary quantity to weigh every container prior to loading. In most cases, even if the capital and equipment existed, there is simply not enough physical space or related infrastructure (such as roads and cranes) to accommodate weighing for all containers at every port in the world. Maher Terminals at New York-New Jersey said recently that it does not have the capacity to perform weighing services, and we are hearing that most U.S. terminals are adapting the same or similar position. However some port equipment providers are advocating that terminals consider providing weighing services to help shippers comply, offering suggestions about where within their facilities containers could most feasibly be weighed. One port equipment manufacturer said in a recent presentation that weighing at the terminal gate would be difficult since some trucks arrive with two 20-foot containers, while others have noted that use of a weighbridge that weighs the full truck is an imprecise measurement since the weight of the truck and any fuel would have to be subtracted out. Weighing using the ship-to-shore gantry crane is considered too late for the weight to be used for the vessel stowage plan- a requirement that the new rule puts on container lines. Thus the suggests that terminals, if they are to get into the business of weighing containers, should do it in the stacking yard. But there there are also challenges and investment required by termials. According to the monitoring equipment provider Strainstall in a recent white paper, "With the 2016 SOLAS regulations in force, it is likely that all new container handling equipment will be designed from the outset to incorporate container VGM (verified gross mass) technology. Other than for the very few new installations currently in planning, however, SOLAS compliance will need to be achieved via the installation of retro-fit solutions onto existing assets." It is unclear how many terminals globally are making this investment. APM Terminals said for example that it is considering weighing services and other SOLAS rule-related services at some ports. More realistically, however the most likely scenario in most cases will be for the cargo and the container to be weighed separately at origin, under Method 2, and the total weight provided as the VGM with a certified signature. However for some cargoes like scrap metal that is loose and difficult to be weighed on its own, it will be necessary to weigh the packed container on a chassis and subtract the chassis. This can potentially be performed at weighing stations at distribution center facilities or independent stations. It means adding time and cost to the contract for the beneficial cargo owner (BCO) with the trucking company and weighing station, as well as capabilities to receive details from them for submission to the carrier. The documentation submitted to the carrier has to come from the BCO or been authorized in a way that prevents fraud and accounts for liabilities. For standard and smaller items — palettes, crates, parts or smaller industrial equipment — the weighing will most likely be performed at the facilities where the packing is done, whether it is BCO owned or a freight forwarder's distribution center. The latter usually have weights for such items but again, the parties need to augment existing commercial agreements to account for labor, costs and time. In some cases it results in adding more weights to the facilities. In a dedicated distribution center, the customer may have to pay, in a multi-customer DC, the freight forwarder has to pay but will most probably pass over the cost. One service says it will show up to a facility anywhere to weigh containers and transmit the VGM to the carrier. 10) Will some terminals agree to weigh containers on behalf of shippers? Yes, but not in all regions. In the U.S. most terminals so far have either said or indicated that they do not want to provide weighing services, given the potential to add to port congestion and the possibility that they will make the necessary investments in new or upgraded equipment but not achieve a remunerative revenue stream. However some terminals, such as those at Mumbai according to JOC.com, appear to be setting themselves up to generate a VGM on behalf of the shipper, given the possibility that many containers will arrive unaccompanied by the VGM. According to the DP World terminal at the JNPT complex at Mumbai, "we will integrate VGM with our existing terminal operating systems, or TOS, enabing the yard cranes to capture the verified weight of the container." DP World at JNPT told JOC.com on Feb 3: "We will weigh containers using our yard equipment and shall integrate weight information with our existing Terminal Operating Systems (TOS). The captured information for Verified Gross Mass (VGM) will reflect during the transaction and be further shared with concerned stakeholders. In a situation where a container vessel shows up at the terminal and the VGM is not provided by the shipper, then the terminal yard equipment will be capable of weighing containers and shall provide the VGM information upon request by the shipper and shipping lines." The possibility that many containers will show up at Mumbai with no VGM is driving the terminals' approach. "Proper weighing facilities may not be ready or available close to the port and there are chances that containers may arrive at the terminal gates without the VGM. The weighing activity is with the lifting equipment and the captured information will be relayed through our Terminal Operating System. There will be no delays at the port as we will integrate VGM infrormation with our existing TOS." 11) What will happen if a container is turned away at the terminal gate or allowed into the terminal but not allowed to be loaded? Containers may get turned away at the gate if they lack the required VGM. Marine terminal operators, already combating congestion due to mega-vessels are concerned that accepting non-compliant containers which by law cannot be loaded risk further congesting their facilities. There are two scenarios if a container gets turned away, one if the container does not arrive at the terminal with the required VGM document and is turned away, and two if it is allowed into the terminal but is subject to a random check and the weight is determined to be different from the declared VGM weight. In the first case arrangements will have to be made to transport, store and weigh the container so a certified VGM can be presented to the carrier and terminal. This will by definition involve additional trucking and storage cost to the shipper, which is leading carriers to be particularly focused on assisting shippers to ensure that containers don't arrive at the gate without the VGM. In the second scenario, the terminal will initially sequester and store the container and will most likely charge appropriate fees, on top of any fines assessed. How each terminal will handle overweight containers is one of the murkiest issues of the container weight mandate. For example, in reference to the question just above this one, it is unclear how many terminals will equip themselves to perform weighing services for containers that arrive at the terminal without a VGM. 12) What is the shippers’ deadline to provide the required container weight verification to the ocean carrier? The VGM "cutoff" will vary by carrier and port and is not mandated by the SOLAS requirement. However practically speaking the shipper must submit it early enough for the carrier to use the VGM figure in its stowage plan, which is a requirment the SOLAS rule puts specifically on the terminal and carrier. According to Hamburg Sud it is the shipper's responsibility not just to generate the VGM but to provide it to the carrier, according to this FAQ. Given that many terminals will not be offering weighing services and will refuse entry to any containers that arrive unaccompanied by the VGM, practically speaking the VGM will have to be in the terminal's hands prior to the in-gate cutoff for a particular sailing. Some U.S. carriers however are saying that terminals should be able to in-gate containers with no VGM if it is provided quickly thereafter so as not to disrupt the normal flow of the container from the in-gate through to loading on the vessel. Ultimately any deadlines imposed will be a commercial matter that is not determined by regulation, and could reflect the specific needs of certain just-in-time or high priority cargo provided, as determined by the relationship between the carrier and the terminal and provided the carrier can still use the VGM in its stowage plan. This is where commercial relationships among the shipper, carrier and terminal operator will come into play as it relates to certain cargoes such as bulk exports that are loaded into containers near the port and sent to the terminal in large quantities. A system among the commercial parties will be required to prevent delays to such cargoes. Shippers are already concerned that cutoff times may vary widely among carriers. “The primary concern is that there is no standard process that carriers are using to implement this regulation. Many of us have received emails and alerts educating us that this rule is coming, but with no content on the procedure,” Donna Lemm, vice president at Mallory Alexander International Logistics, wrote in a JOC.com commentary in October. Carriers can be expected to provide shippers with cut-off times within which the carrier must receive the required container weight verification from the shipper for vessel stowage planning prior to shipment. This will likely be a newly imposed cutoff time separate from terminal arrival cutoff to make a certain vessel sailing. 13) Can a carrier enforce the rule selectively for certain shippers but not others? Likely not. Enforcing the rule will start with government agencies — not carriers — with the container simply not allowed to be loaded without the required documentation. The size or importance of the customer to the carrier would not matter. The only area where carriers will have flexibility is concerning how penalties that get assessed are passed to customers, and how selectively they do it. This is important, because while the legal responsibility for submitting VGM lies with the shipper, the carrier is also required not to load container unaccompanied by the VGM. "It is law, and the liabilities (for a carrier) associated with not complying are really enormous" for example if an accident occurs whether at berth or at sea and it were discovered that no VGM had been submitted for a container that may have been involved, World Shipping Council Chairman Ron Widdows told JOC.com on Jan. 19. But if a carrier cannot load a container, the carrier suffers monetary costs — for loss of revenue and any terminal and handling costs associated with a container that was rejected by the terminal for lack of a VGM — even before any fines by the relevant maritime authority. Thus most carriers can be expected to do whatever is necessary to assist the shipper to obtain the VGM information for a container sufficiently in advance of its arrival at the terminal. While some carriers such as Hapag-Lloyd and Crowley have stated already that they will not load containers without the VGM, the reality is the rule is law worldwide and thus compliance is not a matter of choice for the lines. The gate-in event for a container becomes the moment of truth — whether at port or railhead since after that point any costs associated with the container’s rejection becomes the carrier's responsibility, unless it's known in advance that the terminal will weigh the container on behalf of the shipper. But as answers above indicate, it is not yet clear at all which terminals or how many will offer weighing services or who they would even charge for the service. Certainly container lines will want to avoid a scenario where a terminal bills the carrier for weighing a container given the lack of a guarantee that the carrier will be able to pass that bill along to the customer. 14) Are carriers and terminals required to verify the accuracy of the VGM submitted by the shipper? No. The requirement is for the carrier and terminal operator to ensure only that the VGM has been communicated in sufficient time to be used for stowage planning, and to not load a container for which a VGM has not been provided. There is no legal obligation on the carrier or terminal to confirm the VGM communicated by the shipper, and there is no requirement for the VGM to be conveyed to relevant governmental authorities. There is also no requirement that the carrier or terminal operator weigh a loaded container for which the shipper has failed to provide the VGM, and some terminals are already stating that they will not have services available to weigh containers that arrive at the terminal unaccompanied by a VGM. 15) What costs is the shipper looking at for non-compliance? Actual payment fees for non-compliance have largely not been established or published yet by national governments, but the costs for failing to present a certified VGM document can be expected to go way beyond any actual penalties assessed. In terms of penalties, “Depending on national legislation, national maritime administrations can levy punishments ranging from fines and sanctions to jail time. In the U.K., fines and imprisonment are possibilities,” said Global Shippers’ Forum Secretary General Chris Welsh in a Q&A with JOC.com. But there will be other costs as well. Taking a container off a ship and resulting storage will result in costs applied to the carrier by the terminal. Therefore shippers can expect a non-selective approach by carriers to cost recovery especially now when historically low freight rates in certain East-West trades are leaving container lines with little in the way of profits and a high motivation to recover costs applied to them by marine terminals. Carriers can thus be expected to put preventative measures in place to avoid these costs by ensuring they receive the VGM and refuse to accept containers without it. In a broader sense, multi-national corporations adhere to a policy of 100 percent legal compliance throughout their operations, judging the costs for non-compliance irrespective of the law or jurisdiction to be inconsistent with responsible corporate governance. Thus large shippers are digging deep into their supply chains, making extensive process and operational adjustments in order to ensure they will be in compliance by July 1 irrespective of what guidance, or lack thereof, they are receiving from carriers, governments and other parties. This article describes some of the many steps companies are taking to ensure compliance. 16) Under the new rule there are two two methods by which a shipper may obtain the verified gross mass necessary for submission to the ocean carrier. What are they? The two options are Method 1 and Method 2. Method 1 is that upon the conclusion of packing and sealing of the container, the shipper weighs the packed container itself, or arranges for a third party to do it. Under Method 2, the shipper or a third party working on behalf of the shipper may weigh all the packages and cargo items in the container, including the mass of pallets, dunnage and other packing and securing material to be packed in the container, and add the tare mass of the container to the sum of the single masses of the container’s contents. The tare mass, also called unladen weight, is the weight of an empty container. The tare mass of every container is marked on the exterior of every container at the time of manufacture. Shippers should solely rely on the tare mass number marked on the individual container being used, and should not use a standardized weight for any 40-foot container. Where it is missing, or believed to be inaccurate, the container operator should be contacted to take appropriate remedial action. Some shippers have raised the issue that the tare mass may be inaccurate as a result of an earlier repair or some other reason. For this reason shippers are watching closely what variance from the stated VGM that governments will allow, in the event of an inspection, before issuing a violation. Some governments will require approval for those who carry out Method 2 weighing processes. The UK Maritime & Coastguard Agency government states this in an official document providing guidance to shippers on implementing the rule. Usage of Method 2 "requires that the MCA has to approve the certified method used by that shipper." 17) Are there situations where the cargo doesn't have to get physically weighed? Yes, under Method 2, which allows the contents of the container as well as any bracing materials to be weighed separately and then added to the tare weight (empty weight) of the container, it is possible to sum up the weight of individual sealed cartons where the weight is known in advance and use this figure in the total weight calculation. This method qualifies "so long as the weight is clearly and permanently marked on the surface of each individual sealed package to be stuffed into the container," according to a World Shipping Council spokesperson. "And then the weight of any bracing and securing material, derived by weighing such material, is added along with the tare weight of the container to attain the verified gross mass (VGM) of the loaded container." For example, according to the WSC, "a shipper of identical television sets whose individual cartons are marked by the manufacturer with the shipping weight could calculate the shipment's weight by multiplying the number of television sets in the container by the weight of an individual set, and then adding that to the weight of the combined calculated weight of the packaging, pallets, packing and bracing material and the container's tare weight. This approach has four required elements: It only applies to 1) original, sealed packages, 2) that have been previously weighed, 3) with the accurate mass clearly and permanently marked on their surfaces, and 4) such weights being added to the calculated weight of all packing, securing and other material that may have been used in the packing of the container." The WSC spokesperson added: "We understand this exception will apply to a very small percentage of the total cargo to be moved." However, shippers have pointed out that cartons are made and the weight printed well in advance of the product being packed inside, which could lead to possible discrepancies in the weight of the finished product and its accessories under Method 2. With thousands of boxes in a container, even small discrepancies can make a significant difference to the declared weight. This might help certain shippers in the U.S., said veteran shipping executive Gary Ferulli in a JOC.com commentary published on Feb. 2, 2016. Other than loose agricultural commodities, "those in the U.S. exporting to almost anywhere will have, relatively speaking, the least disruption and additional cost because virtually all packaged goods already have some sort of weight on the packages and in databases for shipping purposes." 18) What are the necessary requirements for those doing the weighing, the weighing equipment itself, and accuracy? The weighing equipment to be used must meet the applicable accuracy standards and requirements of the country in which the equipment is being used. There is no such thing under SOLAS as a “verified weigher.” The only obligation under SOLAS for any party weighing a packed container is to use equipment certified by the relevant national standards. But national standards may get more specific, for example national governments may as part of their enforcement policies implement requirements applicable to owners of weighing equipment and could determine acceptable levels of accuracy of the weighing equipment used. There is no provision in the SOLAS rule for any margin of error; the rule is only a physical weighing requirement, thus verified gross mass derived using compliant equipment and procedures will meet the legal requirements. Some cargo products may incur normal, minor changes in mass from the time of packing and weighing until delivery (e.g. due to evaporation or humidity changes) and some containers’ tare mass may change over time and vary somewhat from the tare mass marked on the container. However, these margins of error should not normally present safety concerns. 19) Why was the container weight rule put into effect? Simply put, shippers — not all of them but unfortunately still too many — misdeclare cargo on the bill of lading, whether out of sloppiness, negligence or willful intent to ship more cargo than allowed for the same rate. According to the World Shipping Council, it is not uncommon for the actual total cargo weight on a loaded vessel to be 3-7 percent greater than the declared weight (weights have long had to be declared on the bill of lading, with the difference under the SOLAS rule being that the weight value has to be derived from an actual weighing process). The impact on safety to workers, ships and cargo can be catastrophic, as these examples indicate. Misdeclarations apply both to weight and cargo descriptions, though the IMO VGM rule applies only to weight. When cargo is misdeclared, since the cargo itself isn’t visible and the ship master’s knowledge of the cargo on board the ship is limited to what is stated on shipping documents, there is significant danger inherent in shipping by container. This rule aims to crack down on one aspect of misdeclarations, that applying to weight, in the hope that the safety of container shipping will improve and overall risk be reduced. "Misdeclared container weights have been a long-standing problem for the transportation industry as they present safety hazards not only for ships and their crews but for other cargo on board as well as workers in port facilities handling containers and on roads," Matthew Gore of the law firm Holman Fenwick Willan wrote in a 2014 bulletin. It's an issue that's been on container lines' radar screens for years. Container shipping founder Malcom McLean highlighed the issue to his subordinates. According to William Gottimer, McLean's former personal and business attorney and general counsel for all his transportation companies from 1991 until McLean's passing in 2001, it was a big issue for the Sea-Land Service Inc. founder. "Malcom McLean had a visceral sentiment on the issue of overweight containers. He strongly believed they were dangerous on the road and in the port. I believe it stemmed from an accident he either once had or knew of where the driver was unable to control the load due to weight. He also knew commercially that strict weight restrictions led to more containers that needed to be moved. He had me speak with each of the various transportation departments of the states up and down the eastern seaboard to seek their support to limit overweight containers citing the constant damage overweight loads were doing on the roads." 20) Why does it appear that there is no leadership or coordination to efficiently get the rule implemented by July? Part of the reason why there appears to be so much confusion, at so many levels, has to do with who's rule this is. The International Maritime Organization is primarily concerned with ship safety and ship operations. The SOLAS convention that was amended to create the rule refers to "Safety of Life at Sea" and traces its origins to the sinking of the Titanic. The IMO has little institutional knowledge of or experience with issues beyond the vessel and especially not into the origins of the supply chain at manufacturing sites where some containers or contents will be weighed possibly hundreds of miles inland from seaports. It is safe to say that in implementing the rule the IMO and others involved were not able to fully envision the complexities involved in complying with the rule, and as a result left the details to commercial parties to work out on their own, with little if any practical guidance other than to say that containers not accompanied by a VGM can't be loaded on the ship. That is why this rule is proving so difficult for so many to get their arms around. The rule brings to mind the U.S. Importer Security Filing, also known as "10+2" to refer to the data points that importers were required beginning in 2009 to submit to U.S. Customs 24 hours prior to the ship sailing from the foreign port. Complying with that rule had significant supply chain implications for U.S. importers, but the rule only applied to the U.S., whereas the VGM rule will be enforced by 171 nations. "Those who wrote the rule have no idea of the complexity of cargo movements through the ports," Agriculture Transportation Coalition Executive Director Peter Friedmann told JOC.com in late January. 21) Is there any global EDI standard in the works to implement the SOLAS VGM rule? Yes, the UN EDIFACT message standard described in this 85-page document has been published by the standards setting body SMDG, a nonprofit that develops and promotes UN/EDIFACT EDI-messages for the maritime industry and is an official Pan European User Group recognized by the UN/EDIFACT Board. But it’s not yet clear how universal the standard’s adaption will be globally and obviously it won’t apply to the significant amount of cargo whose documentation is currently submitted via hard copy, fax or other non-electronic means. As of early 2016 there was an new effort under way to create a new, standardized electronic shipping document solely for the purpose of conveying the VGM along the supply chain. 22) Is there political pushback to the IMO rule? 22) What happens if upon inspection variation is found between the VGM and the actual weight of a container? This question is still very much in the air and possibly a major hurdle to worldwide implementation. Under the SOLAS rule, variances to the signed VGM weight aren’t necessarily illegal but must be defined by the maritime authority of the country where the container was packaged and loaded, opening the door to as many regulatory regimes as there are participating states. The U.K. Maritime & Coast Guard agency said in a document issued in 2015 explaining how it will implement the rule that “It is anticipated that Regulators and other authorised cargo inspectors will use an enforcement threshold ±5% of the verified gross mass of the container. However, this will be used on a case by case basis.” (See section 13.1) The key point there being “anticipated” and with the U.K. being the only nation to have published guidance on variation, it remains to be seen how the UK will actually implement the rule and if other countries will match the plus or minus 5 percent threshold for the sake of uniformity, or establish a different threshold altogether. 23) Do containers being transshipped have to be weighed again at the transshipment port? No, according to an Hamburg Sud FAQ, all packed containers discharged from a SOLAS vessel in the transshipment port should already have a VGM and therefore further weighing in the transshipment port is not necessary. Freight forwarders that have taken over container supply chain management for blue-chip shippers could face a massive increase in liabilities their existing insurance policies may not cover. Matthew Wilmhurst, an associate at UK law firm Holman Fenwick Willan, told the JOC’s Container Trade Europe event in Hamburg last week that changes in the way western retailers subcontract their supply chains, combined with the advent of ultra-large container vessels and vessel-sharing agreements between lines, has left many forwarders dangerously exposed. “The change in the way western retailers are buying their freight services from freight forwarders is impacting forwarders’ position in the ULCV casualty context,” he said. Traditionally, freight forwarders have acted under an agency agreement with the retailer, with a separate bill of lading contract signed between shipping line and retailer. “The role of freight forwarder here was relatively simple,” said Mr Wilmhurst. “Arrange the sea carriage and perhaps arrange carriage at destination, as well as providing a few other value-added services. Because the forwarder wasn’t a party to that contract it did not have any further rights, obligations or liabilities to that contract and carriage. This has meant forwarders tend now to act as a one-stop shop and have set up non-vessel-operating common carrier subsidiaries to issue bills of lading, which legally means they are acting as the principal with the carrier, “so there is a slightly different contractual arrangement”. “There is framework agreement between the retailer and forwarder, which uses its NOVCC to enter B/Ls contract of carriage with the carrier itself. So the forwarder is now assuming those contractual obligations and liabilities under the contract of carriage with the carrier and this where some of the problems for forwarders could arise,” he said. Firstly, Mr Wilmhurst explained, these retailer-forwarder framework agreement normally contain KPIs on delivery times of imported cargo, which not only acts to benchmark performance across a contract period and is likely to be used for contract renewal, but also has the possibility of financial penalties for missing KPIs. “With ULCVs, it means that more cargo for the freight forwarder will be carried on board one vessel, so when there is a casualty involving one of these ships there is likely to be a severe knock-on effect on these KPIs,” he said. However, possibly more worrying for forwarders is their NVOCC arm entering into a contract with the container shipping line, with the B/L including a number of clauses about items such as misdeclared cargo and providing security for General Average and salvage. “In terms of exposure on a ULCV, if you are talking about the loss of an entire 20,000 teu vessel and the cargo, you are looking at something well in excess of $1bn. I had a salvage claim on a 9,000 teu vessel in the last year where the combined value of the ship and cargo was just over $500m. Under the traditional model, the forwarder was under no obligation to contribute to GA and salvage. Under general average rules the merchant – the shipper – has to provide security for General Average and salvage, and its cargo insurance typically relied on insurers to provide for that security. Mr Wilmhurst said: “But under the new model, the forwarder is now responsible for that. “However, many freight forwarders’ liability policies typically won’t respond to that type of demand. Many forwarders’ liability policies will not have the same obligation on the insurers, so forwarders are left in the difficult position of the container line asking for salvage security while the customer demands delivery of the cargo – but he has no mechanism whereby he can offer the same salvage and GA security. “At the same time, shipowners can limit their liability outside of the normal regime but forwarders can’t, and forwarders could potentially receive very significant claims from customers because they are the principal, but what they are able to recover from the shipping line may be significantly less than what they pay out – and the larger the ship, the more cargo carried and the greater this problem will be,” he said. He also warned that this could be exacerbated if cargo is carried on a vessel on which there are a lot of slot charter arrangements with other lines or are operated as part of an alliance. “The forwarder also has no way of influencing the dispatch of cargo that is subject to a casualty. The VSA would have provision over General Average – when the line has to absorb it and when there needs to be a discussion with its VSA partners about whether they should declare GA. He did, however, suggest that the growing power of forwarders might lead to this balance of power being redressed. “I suspect that forwarders and NOVOCCs, given the amount of contractual liability they are taking on and the huge increase in potential liabilities, will try and see that balance of power change somewhat,” he said. Which ones are the Sunnis? In case you forgot here is a scorecard. Most Shias (between 68% and 80%) live in four countries: Iran, Pakistan, India and Iraq. Iran has 66 million to 70 million Shias, or 37-40% of the world’s total Shia population. Iraq, India and Pakistan each are home to at least 16 million Shias. So if helping the Shiite leader Al Assad defeat the Sunni-backed ISIS not only helps Iran and Iraq it should also benefit our allies in Pakistan and India, if the logic holds. In four countries – Iran, Azerbaijan, Bahrain and Iraq – Shia Muslims make up a majority of the total population. And it might create some concern in Lebanon where Hizbullah, Hizballah, etc.—is a Shi'a Islamist militant group and political party based in Lebanon but primarily funded by Iran. But the Shiites are a minority. Lebanon's population is estimated to be 48% Muslim (25% Shia; 23% Sunni). Instead, it seems, Obama has decided to make his enemy’s enemy his friends by backing the Syrians who are not Shiites, and those are the Sunnis, Christians and Kurds; buying them some fancy war boots and letting them do the walking against ISIS and Al Assad. And why should they fight ISIS and the Shiite Assad on our behalf? 1. The US and its allies will give them some fine weapons and most of the men in this region really appreciate a good weapon. 2. The leaders of ISIS are seeking both a self-proclaimed caliphate to politically rule all Muslims, and religious authority over all Muslims across the world. Muslims don't like to be told what to do by anyone but their own leaders. 3. ISIS identifies itself as jehadist Sunni, not unlike the early Taliban under Osama Bin Laden, but far more rutheless and willing to murder across tribal and family ties a far less interested in enforcing the Quoran. Let us put aside the contrived labels and look at this Islamic conflict in historic terms. The competition is, as it has always been, among the Sunni tribes and the Shiite tribes (Shia) whatever else they call themselves. The Islamic radicals are simply the members of those two rival political/religious groups who are willing to murder anyone and everyone to achieve the destruction of their rivals under the bogus façade of their religious background. Now ISL has emerged like the NAZI version of Islamic radicalism willing to slaughter Sunni and Shia, women and children to accomplish its Reich, the Caliphate Reich that dominates all Muslims and their natural resources. But you cannot start with nothing and create a movement. You need a tradition of retribution and some festering hate. It began with Muhammad's death in AD 632, when disagreement broke out over who should succeed him as leader of the Muslim community. None of Muhammad's sons survived into adulthood, therefore direct hereditary succession was never an option. Umar (Umar ibn al-Khattab), a prominent companion of Muhammad, nominated Abu Bakr. Others added their support and Abu Bakr was made the first caliph. This choice was disputed by some of Muhammad's companions, who held that Ali (Ali ibn Abi Talib), had been designated his successor. Ali bin Abu Talib was a cousin of the Prophet Muhammad, the son of the Prophet's uncle Abu Talib. Muhammad Ali was adopted into the Prophet's household when he was a young boy, and he embraced Islam at an early age. Ali married the Prophet's daughter, Fatima, and lived a very humble life. The couple had two children, Hassan and Hussain. Ali was known for being brave and heroic, frequently fighting in defense of the Muslim community. He became known as "the lion of Allah." The Shia Muslims believe that following the Prophet Muhammad's death, leadership should have passed directly to his cousin/son-in-law, Ali bin Abu Talib. Throughout history, Shia Muslims have not recognized the authority of elected Muslim leaders, choosing instead to follow a line of Imams which they believe have been appointed by the Prophet Muhammad or God Himself; the Islamic version of Catholic bishops. The word "Shia" in Arabic means a group or supportive party of people. The commonly-known term is shortened from the historical "Shia-t-Ali," or "the Party of Ali." They are also known as followers of "Ahl-al-Bayt" or "People of the Household" (of the Prophet). Sunni Muslims agree with the position taken by many of the Prophet's companions, that the new leader should be elected from among those capable of the job. This is what was done, and the Prophet Muhammad's close friend and advisor, Abu Bakr, became the first Caliph of the Islamic nation. The word "Sunni" in Arabic comes from a word meaning "one who follows the traditions of the Prophet." In both sects the belief of the other is considered apostacy if not heresy punishable by death or other serious punishment. It may seem as trivial to us in the West as the rift among those who believe that faith alone saves men and those who believe good works are also required for salvation seems to Muslims. In both cases the division has festered into generations of violence and retribution. Of the total Muslim population, 10-13% are Shia Muslims and 87-90% are Sunni Muslims. Most Shias (between 68% and 80%) live in just four countries: Iran, Pakistan, India and Iraq according to the Pew Research Center report: Mapping the Global Muslim Population: A Report on the Size and Distribution of the World’s Muslim Population. Sunnis include followers of the Hanafi, Shafi, Maliki and Hanbali schools of Islamic jurisprudence as well as the Wahhabi or Salafi movement. Shias include Ithna Asharis (Twelvers), Ismailis, Zaydis, Alevis and Alawites. There also are a few Muslim groups that are difficult to classify as either Sunni or Shia. These include Kharijites in Oman and the Nation of Islam movement in the United States, as well as the Druze, who are located primarily in and around Lebanon. While 80% of the world’s Muslims live in countries where Muslims are in the majority, significant numbers – about one-fifth of the world’s Muslim population – live as religious minorities in their home countries. Of the roughly 317 million Muslims living as minorities, about 240 million – about three-quarters – live in five countries: India (161 million), Ethiopia (28 million), China (22 million), Russia (16 million) and Tanzania (13 million). Two of the 10 countries with the largest number of Muslims living as minorities are in Europe: Russia (16 million) and Germany (4 million). These minority populations are often quite large. For example, India, a Hindu-majority country, has the third-largest population of Muslims worldwide. The Muslim population of Ethiopia is about as large as that of Afghanistan. China has more Muslims than Syria; Russia is home to more Muslims than Jordan and Libya combined; and Germany has more Muslims than Lebanon. Between 116 million and 147 million Shias live in Asia, representing about three-quarters of the world’s Shia population (note that Iran is included in the Asia-Pacific region). Meanwhile, nearly a quarter of the world’s Shias (36 million to 44 million) live in the Middle East-North Africa. Looked at in a different way, 12-15% of the Muslim population in the Asia-Pacific region is Shia, as is 11-14% of the Muslim population in the Middle East-North Africa region. The figures for Shias are generally given as a range because of the limitations in the secondary-source data, according to the Pew Study. More than half the countries in the Middle East-North Africa region have populations that are approximately 95% Muslim or greater. These include Algeria, Egypt, Iraq, Jordan, Kuwait, Libya, Morocco, Palestinian territories, Saudi Arabia, Tunisia, Western Sahara and Yemen. Other countries in the region also have populations with a high percentage of Muslims, including Syria (92%), Oman (88%), Bahrain (81%), Qatar (78%), United Arab Emirates (76%) and Sudan (71%). Although most of the citizens of the Persian Gulf countries of Oman, Bahrain, Qatar and United Arab Emirates are Muslim, these countries have a substantial number of non-Muslim workers who are not citizens; this brings down the total percentage of their populations that is Muslim. North Africa is home to the three largest Muslim populations in the Middle East-North Africa region: Egypt (79 million), Algeria (34 million) and Morocco (32 million). Other countries in the region with large Muslim populations include: Iraq (30 million), Sudan (30 million), Saudi Arabia (25 million), Yemen (23 million), Syria (20 million) and Tunisia (10 million). The population of the remaining 11 countries and territories in the region – Libya, Jordan, Palestinian territories, United Arab Emirates, Kuwait, Lebanon, Oman, Israel, Qatar, Bahrain and Western Sahara – totals about 31 million. The Palestinian territories are home to about 4 million Muslims. In addition, Israel is home to roughly 1 million Muslims, slightly more than Qatar. Although Israel has a Muslim population similar in size to those of some western European countries, Muslims constitute a much larger portion (about 17%) of its population. By comparison, the United Kingdom is home to between 1 million and 2 million Muslims, about 3% of its total population. Sizeable numbers of Shias (1 million or more) are found in Turkey, Yemen, Azerbaijan, Afghanistan, Syria, Saudi Arabia, Lebanon, Nigeria and Tanzania. Shias constitute a relatively small percentage of the Muslim population elsewhere in the world. About 300,000 Shias are estimated to be living in North America, including both the U.S. and Canada, constituting about 10% of North America’s Muslim population. Shia Muslims are in the majority in Iran, Iraq, Bahrain, Azerbaijan and, according to some estimates, Yemen. There are large Shia communities in Afghanistan, India, Kuwait, Lebanon, Pakistan, Qatar, Syria, Turkey, Saudi Arabia and the UAE. Shia are 2% of the population. Malaysia bans Shias from promoting their faith. Indonesia is the most populous Muslim country in the world which is dominated by Sunni. The most recent study conducted by Statistics Lebanon, a Beirut-based research firm, found that Lebanon's population is estimated to be 48% Muslim (25% Shia; 23% Sunni), 4.6% Druze, who do not consider themselves to be Muslims, 46.4% Christian. Article 7 of the UAE's Provisional Constitution declares Islam the official state religion of the Union. The Government funds or subsidizes almost 95 percent of Sunni mosques and employs all Sunni imams; approximately 5 percent of Sunni mosques are entirely private, and several large mosques have large private endowments. The government distributes guidance on religious sermons to mosques and imams, whether Sunni or Shi'a, and monitors all sermons for political content. Shias are 10%-20% of UAE's native population. Islam is the state religion of the Kingdom of Saudi Arabia. Saudi Arabia is the location of the cities of Mecca and Medina, where Muhammad, the messenger of the Islamic faith, lived and died, and which attracts millions of pilgrims annually, and thousands of clerics and students who come from across the Muslim world to study. The official title of the King of Saudi Arabia is "Custodian of the Two Holy Mosques"—the two being Masjid al-Haram in Mecca and Al-Masjid al-Nabawi in Medina—considered the holiest in Islam. Saudi Arabia is the birthplace of the Arabic language, the language of the Quran, the central religious text of Islam. In the 18th century a pact between Islamic preacher Muhammad ibn Abd al-Wahhab and a regional emir, Muhammad bin Saud, brought a fiercely puritanical strain of Sunni Islam first to the Najd region and then to the Arabian Peninsula. Referred to by supporters as "Salafism" and by others as "Wahhabism", this interpretation of Islam became the state religion and interpretation of Islam espoused by Muhammad bin Saud and his successors, (the Al Saud family), who eventually created the modern kingdom of Saudi Arabia in 1932. Unlike Iraq and Lebanon which have a sizable number of wealthy Shia, Saudi Arabia has nothing resembling Shia elite of any kind. There have been no Shia cabinet ministers. They are kept out of critical jobs in the armed forces and the security services. Islam is the religion of 98% of Iranians. 89% of Iranians are Shi'a and 9% are Sunni, most Sunnis in Iran are Larestani people (from Larestan), Turkomen, Baluchs, and Kurds living in the south, southeast, northeast and northwest. Almost all of Iranian Shi'as are Twelvers. Iranians are do not consider themselves a part of the Arab world. More than half of the population of Iraq (ca. 60%-70%) are Shia Muslims. Most Iraqis identify strongly with a clan (العشيرة 'ashira). Thirty of the 150 or so identifiable tribes in Iraq are the most influential. Tribes are grouped into federations (qabila). Below the tribe, there are the clan (الفخذ fukhdh), the house (البيت beit) and the extended family (الخمس khams). On its accession to power in 1968, the Ba'ath party announced its opposition to tribalism ( القبلية al-qabaliyya), although for pragmatic reasons, especially during the war with Iran, tribalism was sometimes tolerated and even encouraged. The Ba'th Party was founded in 1943 in Damascus, Syria, by Michel ʿAflaq and Ṣalaḥ al-Dīn al-Bīṭār, adopted its constitution in 1947, and in 1953 merged with the Syrian Socialist Party to form the Arab Socialist Ba’th (Renaissance) Party. The Ba'ath Party espoused nonalignment and opposition to imperialism and colonialism, took inspiration from what it considered the positive values of Islam, and attempted to ignore or transcend class divisions. Its structure was highly centralized and authoritarian. The Syrian Ba'athists took power in 1963, but factionalism between “progressives” and “nationalists” was severe until 1970, when Ḥafiz al-Assad of the “nationalists” secured control. In Iraq the Ba’athists took power briefly in 1963 and regained it in 1968, after which the party’s power became concentrated under Iraqi leader Ṣaddām Ḥussein. Differences between the Iraqi and Syrian wings of the Baʿth Party precluded unification of the two countries. Within both countries the Baʿthists formed fronts with smaller parties, including at times the communists. In Syria the main internal threat to Baʿth hegemony stemmed from the Muslim Brotherhood, while in Iraq Kurdish and Shīʿite opposition was endemic. The Iraqi branch of the party was toppled in 2003 as a result of the Iraq War. Sunnis make up 74% of the total, mostly of Arab, Kurdish and Turkoman ethnicities. Shia's make up the remaining 13%: Alawites are the predominant Shia group, followed by Twelvers and Ismailis. Sunnis are mainly of the Shafi'i madhhab with pockets of Hanafi and Hanbali. Islam is the official state religion of Afghanistan, with approximately 99.7% of the Afghan population being Muslim. About 80-90% practice Sunni Islam, belonging to the Hanafi Islamic law school, while 10-20% are Shias. Majority of the Shiites belong to the Twelver branch and only a smaller number follow Ismailism. The Islamic State (IS) (Arabic: الدولة الإسلامية‎ ad-Dawlah l-ʾIslāmiyyah), formerly the Islamic State of Iraq and the Levant (ISIL /ˈaɪsəl/; Arabic acronym: داعش Dāʿish) or the Islamic State of Iraq and Syria (ISIS /ˈaɪsɪs/),[a] is a Sunni jihadist group in the Middle East. In its self-proclaimed status as a caliphate, it claims religious authority over all Muslims across the world and aspires to bring most of the Muslim-inhabited regions of the world under its political control beginning with Iraq, Syria and other territories in the Levant region which include Jordan, Israel, Palestine, Lebanon, Cyprus and part of southern Turkey. ISIS was preceded by the Islamic State of Iraq (ISI), that was established during October 2006, and comprised of various insurgent groups, most significantly the original Al Qaeda Organization in the Land of the Two Rivers (AQI) organization, al-Qaeda in Mesopotami - led by Abu Musab al-Zarqawi, the Mujahedeen Shura Council in Iraq, and Jund al-Sahhaba (Soldiers of the Prophet’s Companions), which was integrated into the ISI. ISIS members' allegiance was given to the ISI commander and not al-Qaeda central command. The organisation known as the ISIS was formed during April 2013 and has evolved in one of the main jihadist groups fighting government forces in Syria and Iraq. ISIS regards Baquba, Iraq, as its headquarters with its allegiance to Abu Omar al-Baghdadi as the group’s emir. Baghdadi’s real name is Hamed Dawood Mohammed Khalil al-Zawi. The majority of the Taliban are made up of Afghan Pashtun tribesmen. The Taliban's leaders were influenced by Deobandi fundamentalism, and many also strictly follow the social and cultural norm called Pashtunwali. The Taliban (Pashto: طالبان‎ ṭālibān "students"), alternative spelling Taleban, is an Islamic fundamentalist political movement in Afghanistan. It spread throughout Afghanistan and formed a government, ruling as the Islamic Emirate of Afghanistan from September 1996 until December 2001, with Kandahar as the capital. However, it gained diplomatic recognition from only three states: Pakistan, Saudi Arabia, and the United Arab Emirates. Mohammed Omar is the founder and has been serving as the spiritual leader of the Taliban since its foundation in 1994. Work on the Panama Canal expansion projected halted today after negotiations broke down between the Panama Canal Authority and a Spanish-led consortium expanding the canal over cost overruns of $1.6 billion. Consortium GUPC had threatened to halt the project if the PCA didn't foot the bill, which the Authority argues they shouldn't have to pay. "Without an immediate solution, we face years of disputes in national and international tribunals," Sacyr, the Spanish company leading the consortium said in a statement. Without an agreement, the expansion and the jobs of up to 10,000 workers could be at risk, GUPC said. "I don't even want to suggest that the next steps will be easy or risk-free," Panama Canal Authority Administrator Jorge Quijano, said at a news conference. "What I do want to make clear is that we will not yield to blackmail." The $5.3 billion project would double the canal's capacity, having a major impact on global trade. Speculative production in the logistics sector has spiked in Panama as the private sector looks to accommodate an anticipated demand increase for logistics and warehouse space. The project was slated for completion in summer 2015 but that date was moved to late in 2015 when the ACP discovered the cement used by the Spanish contractors was of insufficient quality to hold back the flooding waters of the huge locks. . The consortium said it continued "to seek a solution for funding the completion of the project and completion of the works in 2015, even as the Panama Canal Authority broke off negotiations". The project began in 2009 and is now three-fourths complete. The consortium says extra costs derive from obstacles encountered while excavating and blames it on problems with the studies conducted by the Panamanian authority before work began. However, the root of the problem may come from the consortium's underestimation of the project costs. To win the contract, it submitted the lowest bid, $3.1 billion for its part in the project, $1 billion less than the bid from U.S. construction giant Bechtel, The Miami Herald reports. "It is unjust and impossible for the PCA and Panama to expect that private companies will finance $1.6 billion in costs on a project that was to be fully funded by PCA," the consortium said in the statement. According to Reuters, the Panama Canal had not paid a pending $50 million invoice which would cover salaries this week for subcontractors and workers. A halt in the project is likely to have a significant ripple-effect on ports all around the entire U.S. East Coast. Many ports, including Miami, have borrowed billions of dollars for dredging, raising bridges, digging tunnels and renovating docks and nearby logistics and multi-modal infrastructure in preparation to accommodate the anticipated larger Post-Panama ships in mid-2015. If the Panama Canal delay turns into months, the 'carrying cost' on the interest of the billions of dollars of bonds floated by local, State and federal agencies to pay for all these U.S. ports improvements over the last 3 years could run into the hundreds of millions of dollars alone. Miami Port Authority director Bill Johnson told WPC News this afternoon that work on the Port of Miami in preparation for the Panama Canal project in on track, with the new Port of Miami tunnel opening up in May. "We remain hopeful that there will be a settlement to the Panama Canal dispute," Mr. Johnson said. In the mean time, PortaMiami -- a department of troubled Miami Dade County, is confronted with a projected revenue shortfall over the next decade. To secure bondable income for the landlord port, the county has decided to abandon maritime development and instead afflict dowtown Miami -- another rival city -- with the burden of handling increased auto traffic to the port when the county leases critical waterfront at the port to a foreign consortium to build a Major League soccer stadium. In that case the City of Miami must handle the parking and traffic to the port while the port must pay for the increased cost of port security. The announcement of the Panama Canal project halt -- which could last weeks or months -- is sure to be good news for the canal's latest competitor, the $40 billion Nicaragua canal project which is scheduled to break ground this December. "The work stoppage is a temporary issue, said Rich Thompson, Managing Director - Jones Lang LaSalle. "While relevant, it is still business as usual and their imports will enter the country." "In fact, the project delays will simply give the ports on the Eastern Seaboard more time to complete their modifications. We still believe that the real estate markets around the ports will benefit from the eventual Panama Canal expansion as well as overall growth of the international ocean shipping market and their infrastructure dollars are still being invested wisely," he concluded. While some U.S. government agencies say their programs have been meant to alleviate hunger and promote agricultural production, other programs have helped pry open Haiti’s market, creating millions of new consumers for U.S. agricultural products like rice, poultry, pork and other products while undermining local agricultural production and changing Haitian eating habits. Because some 50% to 60% of the population still makes their living in the agricultural sector, these policies have had extremely negative effects on the economy at large. For example, a 2006 study from Christian Aid estimated that 831,900 people had been directly affected by the 1995 lowering of tariffs that once protected Haitian sugar, rice, and chicken. Haiti now imports at least 50% of its food, mostly from the U.S., and has become the second most important importer of U.S. rice on the planet. For decades, most of Haiti’s food aid has come from U.S. government programs, some going directly to the Haitian government, some to various contractors like World Vision, CARE, ACDI-VOCA, and Catholic Relief Services, and some to other agencies, especially the World Food Program (WFP). The U.S. is the world’s largest food aid donor, accounting for 56% of worldwide food aid in 2010 when it shipped 3.2 million metric tons (MT). The non-emergency food aid program, called “Food for Peace” (established under Public Law or PL 480), cost U.S. taxpayers US$1.5 billion in fiscal year 2012. 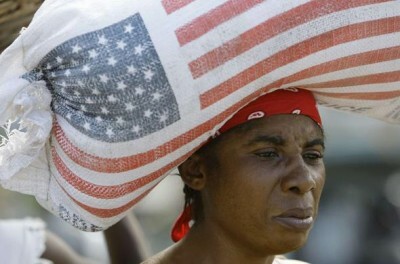 In 2010 and 2011, 10% of food consumed in Haiti was food aid food. Now that number is down to about 5%, according to Pierre Gary Mathieu, head of the government’s food security office, the Coordination Nationale de Sécurité Alimentaire (CNSA). Five percent is still considerable. The U.S. is the only country in the world that obligates most of its food aid to be U.S. produced food. In addition to being questionable for the reasons raised by Mathieu, the requirement also increases the cost of getting food to the needy by at least 23% and sometimes by over 50%. Because of this draconian constraint – meant to supply U.S. farmers with customers – U.S. food aid, including “emergency” aid, takes on average five months to reach its destination. According to a recent USAID report, U.S. food aid to Haiti cost US$1,096 per metric ton delivered, up 100% from 2005 when it cost US$583. “Only 40 cents of each taxpayer dollar spent on international food aid actually buys the commodities hungry people eat,” according Cornell professor Christopher Barrett, author of Food Aid After Fifty Years: Recasting Its Role. Another aspect of current U.S. law is the “monetization” of food aid, whereby the U.S. government buys food from U.S. farmers and ships it to international aid organizations or foreign governments. These then sell the food in order obtain cash for programs. For years, development organizations like Oxfam and even CARE have criticized this practice. Until recently, millions of dollars worth of U.S. rice, beans, wheat and wheat flour, vegetable oil, and other products were monetized in Haiti every year. For example, between 2008 and 2010, about 100,000 MT of food – mostly wheat and flour – were monetized in Haiti. The cash went to USAID contractors, while the government charged a handling fee of between 2% and 5%, according to the GAO. Today, monetization is winding down, but as recently as September 2012, the Japanese government gave the Haitian government 8,660 MT of U.S. rice, which was then sold to Haitian wholesalers. According to the 2010 Sak Vid Pa Kanpe report on the impact of U.S. food aid on human rights in Haiti (from Partners in Health/Zanmi Lasante, the Robert F. Kennedy Center for Justice and Human Rights, and an NYU Law School group), “over the past 20 years, 1.5 million tons of food grown in the United States” had entered Haiti as development or emergency food aid. Food aid is part of the U.S. Farm Bill, a law renewed every five years by the U.S. Congress. In legislation proposed for 2012, the Barack Obama administration tried to institute reforms that would eliminate the link between U.S. food aid and U.S. produced-food and reduce the use of monetization. These changes, and others, would allow for the delivery of more aid, more quickly, at less cost to taxpayers, according to USAID. But what some call “the hunger industry” is big business, as numerous studies and articles have proved [see links to resources below], and its beneficiaries have fought against the proposed legislation. Agribusinesses like Archer Daniels Midland, shipping companies, and some of the big food aid agencies – including ACDI-VOCA, World Vision, and Technoserve, all active in Haiti – have lobbied hard against the administration’s suggestions. Last summer, a bill passed the Senate, but it is now held up in the House. “We are going to probably see a one-year extension,” Oxfam America’s Senior Policy Advisory for Agriculture and Food Policy Eric Muñoz told HGW in a telephone interview on September 6. The Farm Bill is also the law that supplies massive subsidies and other financial support – amounting to between US$10 billion and US$30 billion per year – to U.S. farmers and agribusiness, some of which would be cut in the reformed Farm Bill, if it passes. In his excellent article on the U.S.-Haitian rice and agricultural policy article, “Diri Nasyonal ou Diri Miami” article in the July 2013 issue of Food Security, Oxfam America’s Senior Research Marc Cohen notes: “[b]etween 1995 and 2010, the U.S. government paid nearly US$13 billion in subsidies to 70,000 rice farmers.” Riceland, whose rice sells under the “Tchako” label in Haiti, picked up US$500 million in during that period. The administration’s proposed new Farm Bill legislation changes subsidies and other payments to farmers and agribusiness, but it is unclear what effect – if any – these would have on U.S. rice production and prices. One part of the bill subsidizes agribusiness and farmers, many of whom are millionaires, according to numerous studies. Another part of the bill guarantees that whenever the U.S. government and its contractors decide people are hungry somewhere, U.S. farmers, agribusiness, food processors, and shippers have guaranteed customers for their products. “These programs help us sell our products in markets like Nigeria and Vietnam and … the farm bill is key to sustaining our opportunities in these markets,” Senator Maria Cantwell (D-WA) told Roll Call. When “corporate welfare” or a “jobs bill” are combined with the Washington-demanded policy changes that pried open Haiti’s market by forcing open ports and dropping protective tariffs (first in the 1980s and then again in 1995), the result is devastating for Haitian farmers and a bonanza for U.S. rice farmers and other U.S. grain and food exporters. Before 1995, most Haitian agricultural products – including rice – were protected by tariffs as high as 50%. But that year, a deal was forced on Jean-Bertrand Aristide’s government by the U.S., the World Bank, the International Monetary Fund (IMF) as part of the “Paris Plan,” whose terms had to be accepted before Washington would agree to help return the exiled president to Haiti. Tariffs plummeted to between 0% and 15%, the lowest in the Caribbean at the time. In 2009, some of those tariffs were adjusted upwards, but too little, too late, by most accounts. In its 2006 report Agricultural Liberalisation in Haiti, Christian Aid called the tariff drops “disastrous,” noting that Haiti went from being recently largely self-sufficient in food to using most of its export earnings to buy foreign food, mostly from the U.S.
Today, Haiti’s population of about ten million is one of the best customers of U.S. farmers and agribusiness. In 2011, U.S. exports of agricultural products to Haiti totaled $326 million. The top categories included rice (US$166 million), poultry meat (US$64 million), and animal fats (US$14 million). The “mistake” – which so far has not been corrected – did create a massive market for U.S. products at the same time as it brought about radical shifts in the Haitian diet. Before 1995, chicken was considered “a luxury product,” according to Christian Aid. It was “consumed by the population on Sundays or on special occasions, such as baptisms or when a guest came to stay.” Most chicken sold on the streets or in stores came from Haitian farmers or a few small industrial suppliers. By 2000, 60% of chicken consumed in Haiti came from overseas, mostly from the U.S., in the form of chicken parts, especially dark meat, considered largely unsellable in the fussy, white meat-loving U.S. market. Rice consumption went from about 50,000 MT in 1980 to over 400,000 MT in 2012. Today, “Haitians are among the largest consumers of rice in the Caribbean,” according to the U.S. government. And per capita rice consumption continues to rise. Pegged at 42 kilograms per person in 2010, by 2013 that figure was 50 kilograms. Sorghum and corn, which previously played an important part of all Haitians’ diets – rural and urban – are today considered “inferior” food, according the various studies. As rice imports have skyrocketed, Haitian rice production has remained relatively flat for the past 30 years. Heavily subsidized U.S. rice is consistently priced below Haitian rice. The U.S. Congress will eventually vote a new Farm Bill, which may or may not have changes to both food aid and farmer subsidies. But massive damage from U.S. farmer subsidies, food aid and lowered tariffs has already has been done. As a poor country, Haiti has the right to raise tariffs up to 50%, according to World Trade Organization rules. The government could also undertake programs to attack some of the structural causes of hunger. But it is unlikely that the current government will touch most tariffs. The proposed 2013-2014 budget does announce some changes. Tariffs on foreign corn, pasta, green peas (but not beans), many vegetables, peanuts, fish and shellfish would go up, perhaps in an effort to lessen the flow of products from the Dominican Republic [See HGW 24 Export or Exploit?] But the budget does not mention the tariffs for rice, corn meal, or corn, which are all imported predominantly from the U.S.
On Oct. 1, the Haitian government announced it would not implement the new budget, and would instead renew the previous one. For the third year in a row, the government was unable to gain parliamentary approval for its proposal. “We promise the population that we will bring in a lot, enough to serve the entire distribution chain,” a government official told the press. Outraged farmers called for a boycott, but the rice arrived and was happily purchased. Real Change or Just Tinkering? Donors, government officials and technicians, foreign development and humanitarian organizations, farmers’ cooperatives and associations, and foreign and local agronomists all agree on one thing: Haitian agriculture and food production are in critical condition, and this is a major reason for Haiti’s hunger. As noted in Why is Haiti Hungry?, Haiti’s land tenure system is one of the biggest impediments to food sovereignty. Most farmers working the land do not own it or have dubious deeds. Also, for the past four decades food aid has flooded the country while Haiti’s agricultural sector has been ignored. Neoliberal policy shocks have had disastrous effects. In 1995, foreign assistance for agriculture and for food aid were about the same. Not for long. As farmers struggled against subsidized foreign products, food aid rose while assistance to agriculture dropped. The trend has recently changed. Since the 2010 earthquake, there has been a steady drop in food aid and a marked rise in foreign assistance for the agricultural sector. Many of the grants and programs cover aspects of the government’s National Agriculture Investment Plan. With a budget of about US$790 million, the plan has been changed since it was originally proposed. It had to be “revised” prior to gaining the approval of important donors like the U.S. government. In its press releases and media appearances, representatives of the Michel Martelly government have implied the “Plan pour la Rélance Agricole” was invented after the election but, like many other programs, it was already in process when the singer took power. Similarly, the government’s “Aba Grangou” (Down with Hunger) program is in fact a “brand” given to cover 21 programs – most if the agriculture programs – that are often carried out by foreign agencies or organizations. Associated with Aba Grangou, or on their own, across the country, large and small donors, sometimes in conjunction with the Agriculture Ministry, are running interesting and even promising projects and programs that aim to alleviate hunger and also address the agricultural production crisis. For example, the Inter-American Development Bank has funded a US$27 million pilot land tenure security program aimed at clarifying land ownership. Other projects focus on fisheries, developing seed banks, and improving roads and irrigation canals. The government and donors are also trying to promote and use local products as much as possible. A World Food Program pilot program is using locally produced milk and other foods, while USAID is funding a program to help sorghum growers improve their output so that the Brasserie Nationale d’Haiti S.A. (BRANA), a Haitian brewery now owned by Heineken, can replace some of the grain it imports with Haitian production. USAID is planning very little food aid after 2014 and is instead focusing on agricultural development through a program called “Feed the Future” (FtF) targeting the regions around Port-au-Prince, St. Marc, and the Northdépartement (province). FtF’s objectives include increasing output of crops for export (notably mango and cacao), output of grains and other food for local consumption, and planting of crops and trees in order to protect watersheds. Haiti Grassroots Watch is a partnership of AlterPresse, the Society of the Animation of Social Communication (SAKS), the Network of Women Community Radio Broadcasters (REFRAKA), community radio stations from the Association of Haitian Community Media and students from the Journalism Laboratory at the State University of Haiti. This series distributed in collaboration with Haïti Liberté.